From 1980: All change. Again. Just months after the last reboot, the Bullpenners toiling above the shops at 205-211 Kentish Town Road received the latest DOCTOR WHO WEEKLY sales figures... And saw the downward trend continuing. 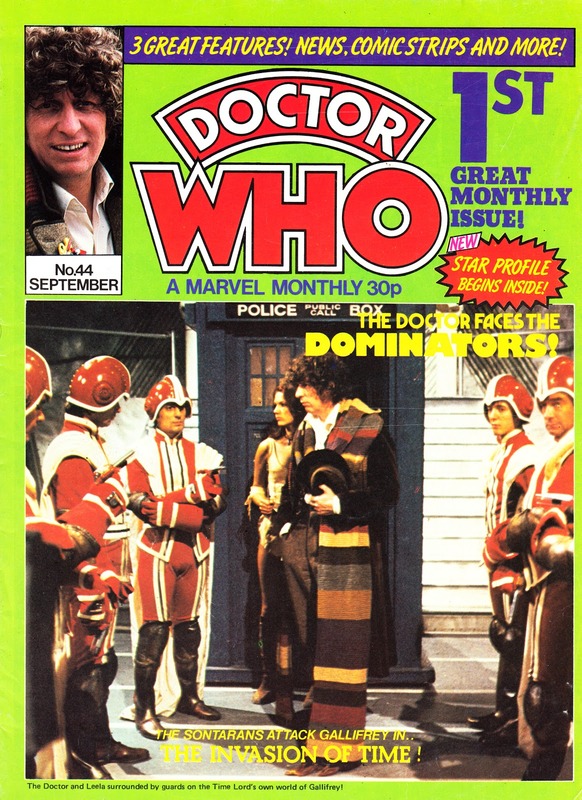 The weekly's high costs (origination fees and licensing payments to the BBC) made it stand out alongside the other British reprint titles and, with Dez Skinn gone, the desire to originate material that could be shipped back to the States had all but vanished. Cancellation was starting to look like an attractive option for the accountants. Desperately, and apparently at the last possible moment (the cover design for DWW had already been completed by someone who obviously liked to work ahead... It eventually appeared in the 1989 10th anniversary special), Marvel rolled the dice again and took the tried-and-tested (since the days of Rampage weekly) decision to relaunch again... As a monthly. The economics were twofold. Marvel could justify a higher cover price (leaping from 12p to 30p an issue) but, although the page count increased, the margins per copy improved (although whatever bulk deal Marvel had with the printers may have been eroded as the number of copies rolling off the presses each year would inevitably be less). Keeping copies on sale for a month also meant readers had more chance to find - and buy - a copy before the next one shipped. Marvel also savagely cut costs. The biggest drain on the bottom line was the investment in new strips. So Marvel kept the page count per issue the same as one copy of the weekly... But left it on sale three times as long... And charged more. Bad news for the creators but good news for the bottom line. Each issue was bulked out with a new emphasis on text features devoted to the show itself. These were, inevitably, a lot cheaper to originate than the strip pages and, possibly inadvertantly, appealed to the show's older fan base. They didn't know it at the time, but they had just secured the future of one of only a handful of Marvel UK titles (the others being STARBURST and the first few COLLECTORS EDITIONS that launched in the final months of the Annex of Ideas and flourished under Panini) to outlive the company itself.